Cusumano has long been a go-to for expressive and enjoyable wines from Sicily that offer terrific value for the money. 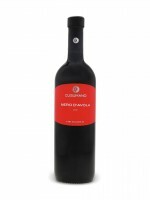 Nero d’Avola is the black grape responsible for this savoury, dry red that offers cherry and berry jam flavours with some exotic spice and a refreshingly tart finish. The bright acidity makes this a winning match with dishes with tomato-based sauces. Love the stylish Vino-Lok closure that maintains the freshness and fruitiness of this best buy.